Paula did the weaving on a Quilters Cut ‘n Press II. This is made by June Tailor. The same company makes a number of different sizes of lined padded surfaces suitable for weaving. One of our favorites for larger projects is called Pin-Weave Express. It has a 16” x 26” lined surface for weaving, very desirable if you decide to weave a large block, inset or border. It is also lined in 1/2” increments, which would be useful if you decide to use narrower strips for a project than we have used in ours. Of course, you can make a weaving surface, as Paula demonstrated on the show, from cardboard, batting and muslin on which you have drawn lines at 1" intervals. Instructions for the Trapunto by machine techniques are included in our “Tequila Sunrise” pattern. However, should you wish to delve deeper into the subject, Hari Walner has written two books on the subject — Trapunto by Machine (C&T Publishing) and Exploring Machine Trapunto (also C&T Publishing). We have two patterns available for the woven quilts! 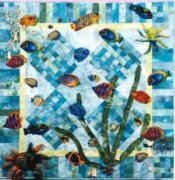 The first, “Tropical Seas”, is for the 34” square “fishy” quilt that Paula was demonstrating on the show. The pattern includes instructions for the weaving, piecing, and machine appliqué to complete the quilt. You can order it HERE! The second pattern is for the large (67”x 84”) pastel quilt that was hanging on the back wall of the set. 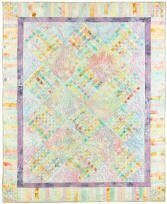 This pattern is called “Tequila Sunrise” and includes instructions for the weaving, piecing, and Trapunto used to complete the quilt. You can order it HERE!